July | 2017 | Uncommon Mariners – Welcome to the World of Mariners, Pirates, and the Eternal Sea! Last week they celebrated the birthday of Ernest Hemingway in Key West, and the response I got was overwhelming for a peek inside the raucous days leading up to the celebration. As a bona fide conch who has visited Key West so often that the clerks at Fausto’s know me by my first name, I’d like to share some of the tomfoolery with you. A couple weeks before the big bash begins, Hemingway look-alikes begin to show up in restaurants and bars all over town. As the event draws closer, they become more numerous, appearing on the streets often two and three at a time. Soon, like Santa Claus at Christmas, they are everywhere. And just when you thought you saw one who is a dead-ringer for Ernest, another appears looking even more stunningly like him. By the time Hemingway Days begins, Ernest is everywhere, his full white beard, round face, and sparkling eyes staring back at you from across the bar, his lips pursed tightly against the mouth of a tall glass filled with dark amber. 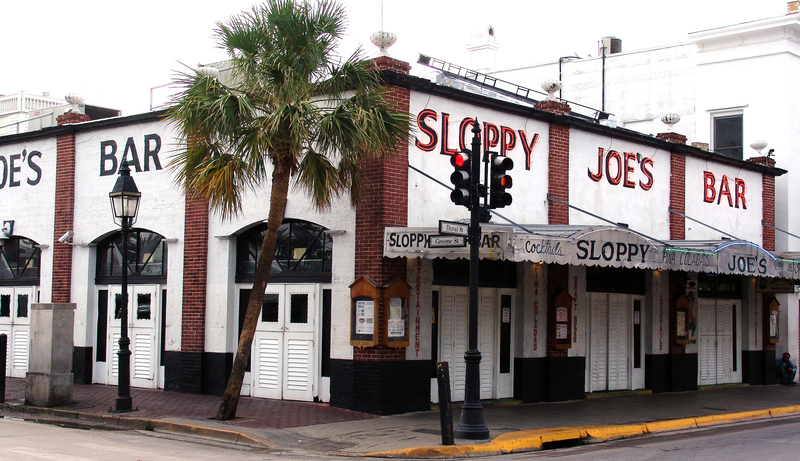 The epicenter for the main activities is Duval Street, particularly Sloppy Joe’s Bar, where for three nights, competitors take the stage and make speeches Hemingway would probably cringe at. It’s good, boisterous fun as family, friends, and total strangers wildly applaud. Sometimes Hemingway look-alikes pepper their speeches with a song or ditty that would raise a chuckle from the real Ernest. Each night, the best are culled from the group. These semi-finalists then compete on Saturday night after the running of the bulls. The winner, of course, becomes the new Ernest Hemingway look-alike who reigns for the following year. Ernest’s competitive nature naturally extended to fishing and hunting. A number of photographs show him standing on a Key West dock with gigantic marlins he hauled in on the boat of his friend, Sloppy Joe Russell. Sloppy Joe opened up a bar off Greene Street shortly after Prohibition ended. Hemingway inevitably ended up there after a good day’s work at his home just a few blocks away on Whitehead Street. Hemingway spent many an afternoon hanging out at the bar his good friend Sloppy Joe Russell owned. And what would Hemingway Days be without a three-day fishing tournament where the game is marlin. tuna, wahoo, and more; prizes of $50,000 go to the winners. If you believe the competitors in the bars, they hooked fish far bigger than the winners did. Understandably, the size of the fish grows in proportion to the number of beers the bearer of the tale has. Because Ernest is one of the most famous writers that ever walked the planet, readings and literary presentations are held throughout the week. There is even a writing contest judged by his granddaughter, Lorian Hemingway. Entrants must submit their pieces months ahead of time in order for them to be judged in a timely fashion. Everyone is more like family at the running of the bulls. Except of course the bulls themselves. My favorite part of the whole celebration occurs on Saturday morning outside Sloppy Joe’s. Spectators and Hemingways. dressed in the traditional matador garb of white shirt and pants, and a red bandana, casually mull around the corner of Duval and Green St. It’s an opportunity to mingle with the look-alikes and have your picture taken perched on top one of the bulls huddled in the middle of a roped-off corral. Some people, usually the ones who have imbibed a little too much, claim the bulls have been drugged so as not to be too dangerous when they run at one pm. That’s not true at all. 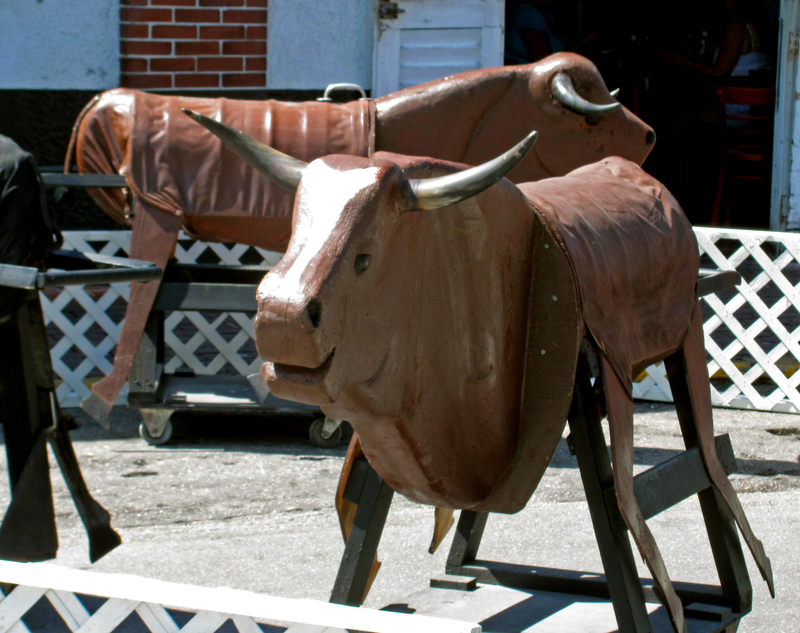 These bulls may seem ferocious, but they are used to the craziness of Key West. Let me give you a little lesson on the anatomy of these bulls. Their muscular bodies, supported by wooden frames, are crowned with eyes that look like they’ve spent too much time under the tropical sun. A rope tail hangs from their backside and under their staunch legs are wheels so that when the Hemingway look-alikes push them around the block during the running of the bulls, they won’t become annoyed. Let me see how I can put this next description delicately for the ladies. 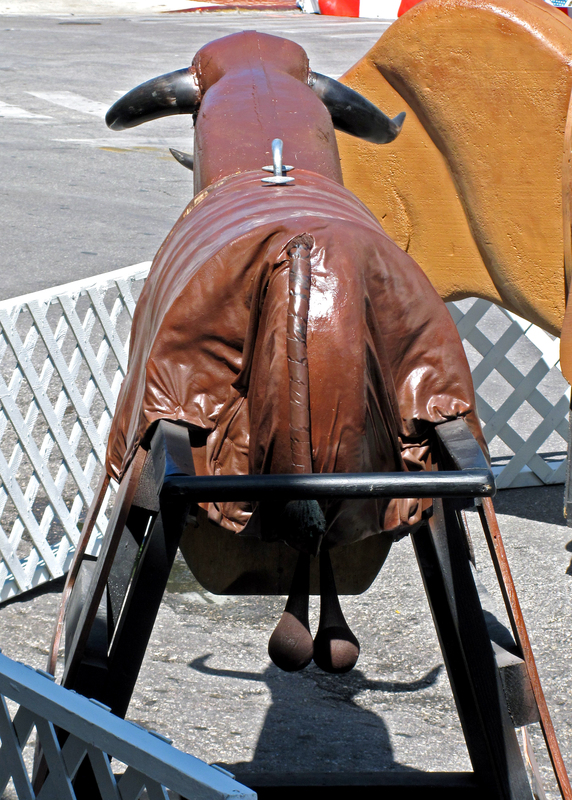 To make the bulls particularly realistic, they have hanging under them equipment that helps bulls do what bulls do so well with their girlfriends. 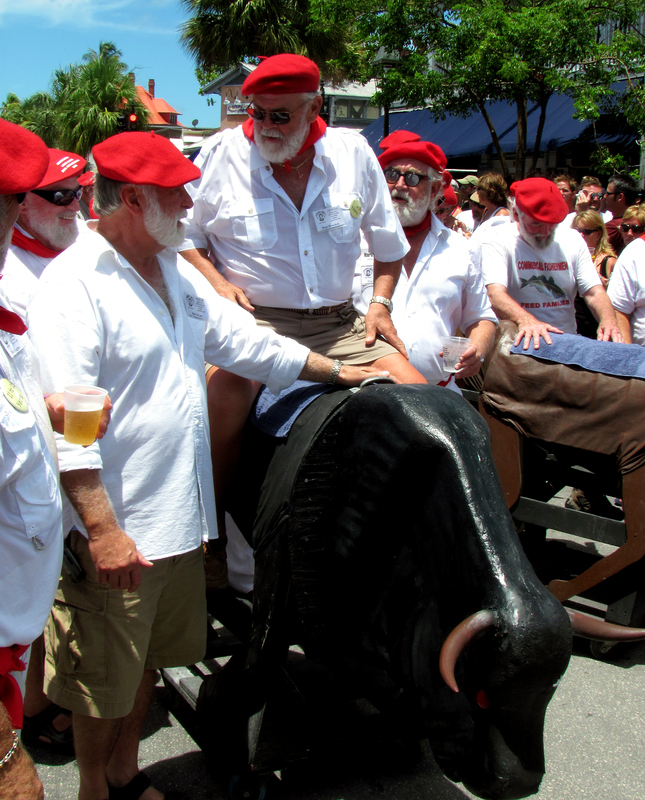 If you were in Pamplona, Spain where Hemingway attended the running of the bulls and the bullfights afterwards, it wouldn’t be hard to mistake Key West bulls for the real thing. Some tourists with one too many margaritas under their belt think the event is called the running of the balls, but that’s not true at all. After a morning of slipping on and off these dangerous creatures to get their picture taken, the crowd, like the bulls, is pretty much exploding with excitement. 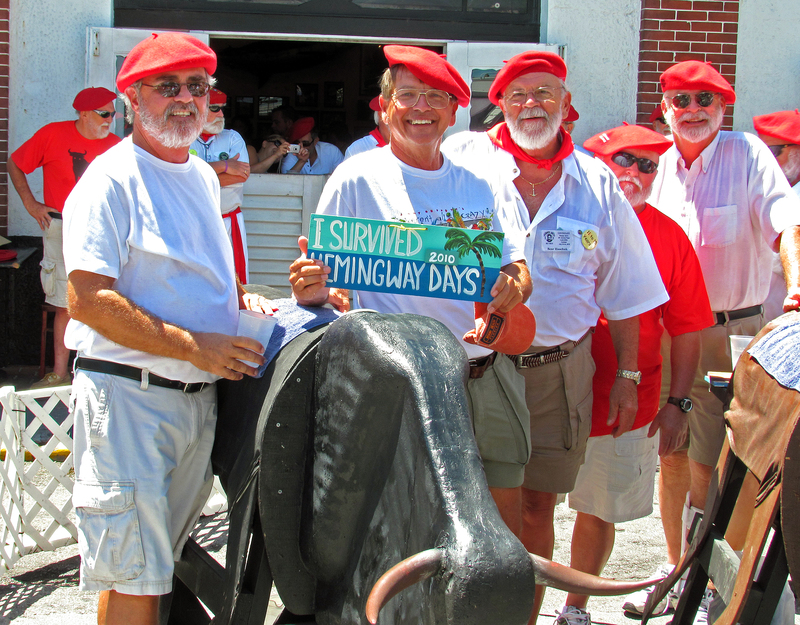 At one pm the bulls are released from their pen with Hemingway winners from past years bravely mounted on top. The frenzy is on, and the crowd mixes with the snorting bulls as look-alikes push them around the block of Sloppy Joe’s. This is a dangerous job, but these brave men are well up to the task. I can testify to just how dangerous this event is. With a cigar in one hand and a margarita in the other, I found it hard not to spill my drink as I doubled over with laughter rounding the first corner of the block. Within ten or fifteen minutes, it’s all over, and the exhausted bulls return to their corral, while the crowd breaks for Sloppy Joe’s, dying of thirst. I still remember the year when, after the race, a huge birthday cake lay on a table outside the bar. There was enough to feed everyone in Key West. Twice. We all sang happy birthday to Ernest, then one of the winners of the look-alike contest from the previous year cut the cake. Borrowing an old wedding tradition, he fed the first slice to another Ernest. Despite the exhausting run, these Hemingway winners from years past lead the crowd in singing happy birthday to Ernest Hemingway. I don’t think I need to tell you what happened next. Do you know what a mess white icing and yellow cake make when smeared all over a full white beard? You can travel to Africa like Hemingway did, or go fishing out in the Gulf Stream, but it’s going to be hard to have as much fun as you will in Key West at the Hemingway Days. Maybe I’ll see you there next year. 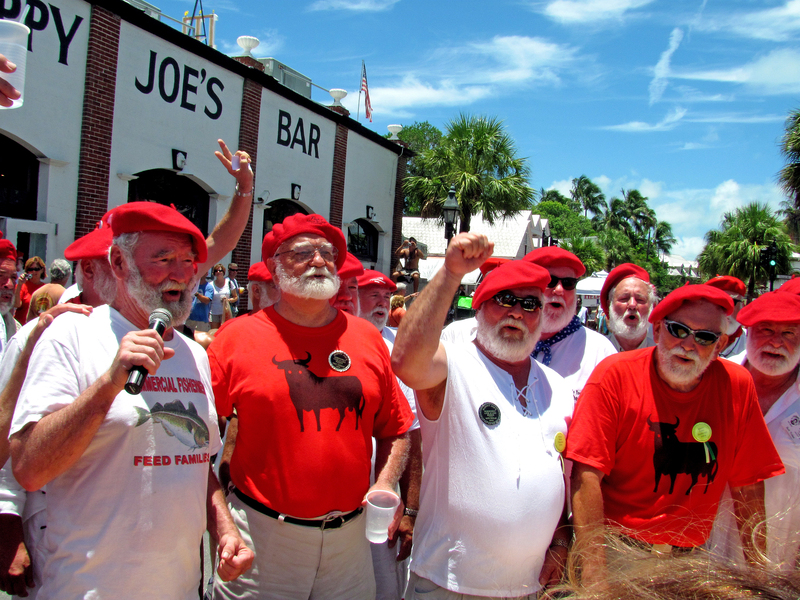 For a small donation, that profits local charities, you can even get a red beret like the Hemingway look-alikes wear. You’ll have fun and lots to drink, but you have to bring your own cigar. And try not to knock the drink out of my hand going around that first corner of Sloppy Joe’s. It’s a long block under a hot tropical sun, and no one wants to take the chance of dying of thirst among a herd of excited bulls. Today is Ernest Hemingway’s birthday. He was born in Oak Park, Illinois July 21, 1899, but his travels took him from the heartland of America to half way around the world several times. He served as a medic in Italy during World War I, and while recuperating from a wound, met his first wife, Hadley Richardson, his nurse. Later, while covering the Spanish Civil War, he fell in love with the Spanish culture. His experiences became the foundation of A Farewell to Arms, Death in the Afternoon, For Whom the Bell Tolls as well as countless other stories. Hemingway has been called a lot of things in his life. Journalist, author, fisherman, big game hunter, and lady’s man. Crackpot is also one of them. Some people say he was nuts because of his eccentricities and wild choices. For example, how many people do you know would keep dumping one perfectly good woman for another? Okay, I get it. A couple thousand. But how many people do you know who get high on covering war up front and personal? I’ve always admired Ernest Hemingway, probably for the same reasons Hemingway loved Mark Twain. His writing was impeccable. By that I mean you would be hard-pressed to delete one word from The Old Man and the Sea without affecting the impact of the story. That was his signature style. The story is about an old man who triumphs after battling a marlin, only to lose it to sharks before anyone can see what a splendid fish he has caught. But the story is also about you and me and the struggles we face. Like the old man losing his great fish to the sharks, we sometimes lose to forces beyond our control. But Hemingway shows us there is dignity in loss. The old man does not whine. Nor does he pity himself. He accepts his fate, knowing defeat is part of life, and life is good. Probably what few people don’t realize about The Old Man and the Sea is that the story is a metaphor for Hemingway’s life. He published it in 1952, 12 years after publishing For Whom the Bells Toll. At this point in his writing career, critics were calling him washed up and an impotent writer. What kind of a man can reach deep into his soul and dredge up a marlin of incredible power and beauty, and along with it, ravenous sharks who will mercilessly devour his prized possession? Hemingway worked on The Old Man and the Sea after moving out of his home in Key West and settling in Cuba. When he finally polished the last paragraph, he must have sensed he had written something that was timeless. His life ended in tragedy when he took his life July 2, 1961 after an agonizing bout with depression that included inhumane shock treatments at the Mayo Clinic. Ernest Hemingway’s life should not be judged by the way it ended, but rather by the legacy he left us. He was a character of epic proportions, much like Odysseus and Hercules who, despite their flaws, proved powerful and almost magical in the way they challenged life. fight the sharks that inevitably come everyone’s way. Happy Birthday, Ernest. And I hope you hook a big one wherever you are!